Bengaluru: “Japan would like to extend support to IIM Bangalore and the India-Japan Study Centre at IIMB for our association to attain greater success,” said Chief Guest H.E. 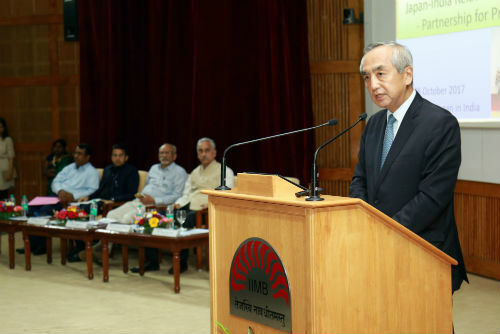 Kenji Hiramatsu, Ambassador of Japan in India, during the Foundation Day Lecture at the 44th Foundation Day celebrations of Indian Institute of Management Bangalore (IIMB), on Saturday, October 28, 2017. This year’s theme for the Foundation Day Lecture was ‘Japan-India Relations in a New Era: Partnership for Prosperity – Toward a Free, Open and Prosperous Indo-Pacific’. In his address, Ambassador Hiramatsu discussed the current Japan-India relations with reference to the highlights of Prime Minister Abe’s visit to India last month and delved into how Japan and India could take the world’s most promising partnership yet, forward. He spoke at length about the opportunities of cooperation between India and Japan: for peace and prosperity of the Indo-Pacific Region and the world, enhancing cooperation on regional and global issues, enhancing defence and security cooperation, investment and development cooperation, and so on. 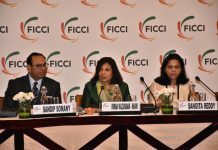 “I have special interest in enhanced cooperation for the start-up business between the two countries. There is a lot of synergy between the two countries and opportunities where we can collaborate with and support each other. The relationship will provide greater stability for the entire region, economic and otherwise. Let us work together for the Japan India bilateral relationship to flourish,” he said. IIMB Director Prof. G. Raghuram, while introducing the Chief Guest, said that the presence of the Ambassador assumes significance since it was on September 14 this year that IIMB inaugurated the India-Japan Study Centre. While Prof. Murthy emphasized the importance of handling and overcoming internal challenges, Prof. Rao said that it is a challenge to promote research with limited funds, Prof. Apte spoke about autonomy issues and balance between teaching and research, and Prof. Sushil Vachani said that being an ‘outsider’ to the IIM system never posed a challenge. Prof. Raghuram said his motivation to take charge as Director was his aspiration to be able to express himself on multiple dimensions beyond academics, and to reach out to as many stakeholders as possible. “But we must not rest on our laurels and need to do a lot more,” he added. The panellists all agreed that other than resilience, the other key to success is to adapt to changing situations, internationalising (in terms of both students and faculty), and boosting interest in all areas of management. 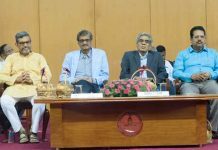 “The heart of the institution is the faculty and their energy needs to be harnessed to the fullest,” observed Prof. Kumar. As part of the celebrations, D Muralidhar (PGP 1977), Founder, SNAM Abrasives Pvt. Ltd., along with Sameer Suneja (PGP 1994), Global CEO, Perfetti Van Melle, and Dr K P Krishnan (FPM 2003), Secretary, Ministry of Skill Development and Entrepreneurship, GoI, received the Distinguished Alumni Award (DAA) 2017, presented by the Chief Guest. Prof. Vasanthi Srinivasan, Chairperson, Alumni Relations at IIMB, introduced the Distinguished Alumni awardees. 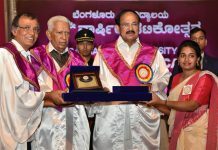 It was a proud moment for the institute to be able to honour the three awardees for their significant professional excellence as well as their contribution to industry, academia and society. In keeping with the institute’s tradition, each recipient of the Distinguished Alumni Award received a citation and his name was engraved on the Wall of Fame at the institute. In his acceptance speech, DAA winner D Muralidhar said it was a momentous achievement for him to be recognized as a distinguished alumni by his alma mater IIMB. “In the journey of life, no other moment can bring so much of joy and a sense of satisfaction and validation. It is impossible to recollect and thank everyone who walked with me to reach this outlier status,” he added. IIMB Director Prof. G. Raghuram presented a report on the institute’s achievements during the year 2016-2017. Highlighting the school’s research endeavours, partnerships, faculty and student accomplishments, he said that the students, faculty and alumni continue to do IIMB proud. He also listed various recent and upcoming partnerships of IIMB with leading organizations in the world for attaining greater heights in the field of academics and research. “The India-Japan Study Centre, launched in September at IIMB, will promote understanding of Japan in India and India in Japan through research, teaching and policy outreach efforts. IIMB’s faculty have collaborated with Japanese institutions, conducted joint research and offered Executive Education Programmes. The India-Japan Study Centre will build on these initiatives and take the collaboration to the next level. IIMB has launched a MOOC on Sustainability in Japanese. The school already offers an elective course, ‘Business Planning for International Markets’, with specific focus on Japan, along with a Japan language elective course. The centre will facilitate collaborative initiatives among academia, industry and government agencies of both the countries to work on areas of mutual interest”. Talking about the BPIM, he said that Japan is the most favoured destination for students. “Next week, we will be launching the Israel India Centre at IIMB with H.E. David inaugurating the centre. The launch will also mark 25 years of India-Israel partnership,” he added. Prof. Raghuram also announced that IIMB is starting a doctoral programme on Entrepreneurship which will help in firmly establishing IIMB’s leadership position in the field of entrepreneurship, both qualitatively and quantitatively. “IIMB is the first IIM to launch such a programme”. He also spoke about IIMB’s new initiatives and IIMB’s second campus. He also spoke about Kris Gopalakrishnan, whose tenure as Member of the Board of IIMB came to an end yesterday (Oct 27). 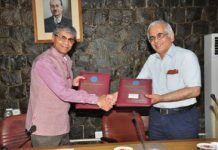 “He has been a friend philosopher and guide for IIMB and has taken keen interest in the activities of the institute, especially NSRCEL and was instrumental in the collaboration between IIMB and IISc for a science-based enterprise. As part of the Foundation Day celebrations, a cultural programme and prize distribution for SRC events were conducted at the auditorium on October 27, which saw the IIMB community participate in full strength. Moreover, there was PGP 2001 and UBUNTU Scholarship Awards, prize distribution to faculty, officers, staff and their families for outstanding achievements in the fields of academics, sports and arts, and the Foundation Cup awards.